I hesitate to even post this link because I have a feeling this will completely crash their computer system, but here goes anyway: Southwest Airlines Vacations. Affordable vacation packages to destinations from coast to coast. Okay, so the link text doesn’t do a great job of selling you on clicking, but once you do see the page this will take you to you’ll thank me. Everyone knows Southwest Airlines is consistently a low-price leader among US airlines, and in case you hadn’t heard, their packaged vacations are just as tempting. But at the moment they have various packages on sale. For example, between now and January 31 you can save up to $100 on a Las Vegas package, and those savings are on top of the already-low price. 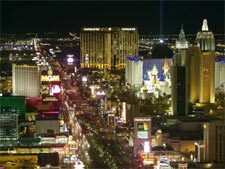 Can you think of what you might do in Las Vegas with an extra $100? Yeah, I can too. I have a system when playing slots that I think will bring the city to its knees. Come to think of it, it might be better if I play it somewhat cool and only win a few thousand at a time? If I cleaned out a whole casino each visit they might get suspicious. Hey, why do these big casinos keep going out of business one by one, they’d ask each other? And I’d just start whistling some random tune so they don’t suspect that I’m involved. That always works on TV.